Hamilton is located in the province of Ontario, Canada. It is a port city on Lake Ontario, in a region known as the Golden Horseshoe. It is the ninth largest city in Canada. With steel production originally being its most important industry, the city was known as “The Steel Capital of Canada” and “Steeltown”. Its more recent nickname is “The Hammer”. Green space is plentiful in Hamilton. Escape to the outdoors with a visit to the Royal Botanical Gardens, the largest of its kind in the country, or explore Bruce Trail, Canada’s longest and oldest path. 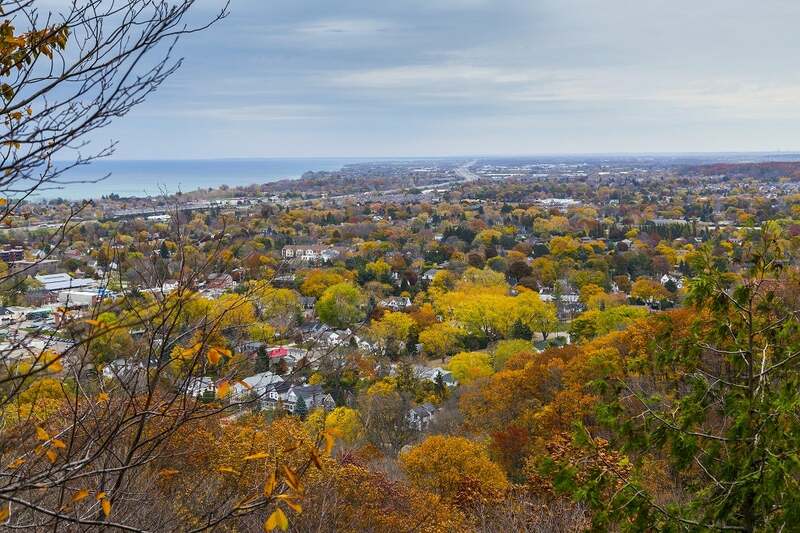 There are many parks and trails throughout the city, including some through the Niagara escarpment and alongside the shores of Lake Ontario. This region is rich in history and culture, which is showcased throughout the city. Learn more about WWII airplanes at the Canadian Warplane Heritage Museum, or visit a naval destroyer at the HMCS Haida National Historic Site. From museums to walking different neighbourhoods, exploring Hamilton’s heritage is full of surprises. Hamilton is approximately 45 minutes from Toronto, the province’s capital and the largest city in Canada. Many Torontonians are migrating to Hamilton for its affordable housing. But there’s much more to Hamilton than a bedroom community. It is becoming a thriving place for the arts, music and film. The downtown area offers street festivals, a farmer’s market, plenty of restaurants, hockey and theatres – there’s always something to do here. Manufacturing is still an important economic sector in Hamilton. Steel production was the major industry, but now the economy is becoming more diversified. Food-processing plants and the Hamilton Port Authority supply many jobs to local residents. Other growing job markets include non-residential and residential construction, life sciences, healthcare, education, agribusiness and technology. The most recent unemployment numbers show Hamilton’s rate just below the Canadian average. The new megacity of Hamilton was formed in 2001. It now boasts over 200 neighbourhoods. The Niagara Escarpment runs through the metropolitan area, dividing it into the lower city (below escarpment) and the upper city (sometimes called the mountain). Dundas: Close to McMaster University, Dundas was a small town before becoming part of Hamilton. It still has a small town feel, with historic homes and a great downtown area. Kirkendall: This quiet neighbourhood is quickly becoming trendy and popular with families. Property values here have greatly increased as the area is becoming quite desirable. The Bruce Trail runs through Kirkendall, and the Niagara Escarpment is to the south. Westdale: A trendy and artsy neighbourhood. It’s family friendly, with schools and parks nearby. Buying a house is a bit more expensive here, although there’s a good number of affordable student rentals. Waterdown: Another former town, Waterdown is now part of the greater Hamilton area. Its population is quickly growing. Many single family homes continue to be built in this neighbourhood. Corktown: One of Hamilton’s first neighbourhoods. Corktown is part of the downtown area, and within walking distance to Go Transit, shops, pubs and cafes. This area is dotted with beautiful brick homes and semis, along with trendy condos. St. Clair: Posh and expensive, the St. Clair area is known for its grand architecture, wide boulevards and mature trees. Several homes in this neighbourhood are part of a heritage conservation district. With Toronto housing prices still skyrocketing, many of its residents are choosing to move down the QEW to Hamilton. Renting or buying a home is much less expensive here, and the commute into Toronto is about 45 minutes by bus or train. Price and location is turning Hamilton into a hot real estate market. The area is so sizzling that the Real Estate Investment Network ranked Hamilton the top Ontario investment town for 2011-2015. The following year-to-date sale numbers for the Hamilton area are listed in Canadian dollars. The average sale price of freehold homes was $354,834; this includes single family, semis and townhouses. For condos, the average was $227,869. Condo sales are on the rise, with increases in new listings and new construction. When renting in Hamilton, expect to pay an average monthly rate of $588 CAD for a bachelor apartment. A one bedroom apartment costs an average of $766. Two bedroom apartments rent for $932, while three bedrooms would cost $1,130 per month. The vacancy rate has been stable at 3.4 per cent. This means a good supply of available apartments on the market. There are growing concerns, however, that not enough apartments are being built to keep up with population growth. Schools in Hamilton follow the Ontario curriculum, as in Canada, education is the responsibility of the provincial government. Most parents send their children to public schools in Ontario since their schools are known to be amongst the best in the world. For publicly funded schools, parent may choose from the following school boards, depending on their program choices and requirements. Hamilton-Wentworth District School Board: The largest school board in Hamilton. They operate over 100 English language schools, some offering a French Immersion program. Hamilton-Wentworth Catholic District School Board: With over 50 English schools, this board offers catholic education. They also offer a French Immersion program. Conseil scolaire Viamonde and Conseil scolaire de district catholique Centre-Sud: There are a few French schools in Hamilton. These schools target Francophone families, as all subjects (except English Language Arts) are taught in French. For post-secondary education, McMaster University is the largest in Hamilton. They offer numerous undergraduate and graduate programs at their 300 acre campus. Local colleges include McMaster Divinity College, Mohawk College and Redeemer University College. Hamilton is easily accessed by car, via the Queen Elizabeth Way (QEW) and Highway 403. Highway 401, Ontario’s busiest highway, runs about 40 km north of Hamilton. Hamilton has a VIA Rail Canada station, as well as an airport named the John C. Munro International Airport. For those commuting to Toronto, Go Transit offer train and bus services. The Go Train’s Lakeshore West line goes from Hamilton to downtown Toronto. Several Go Bus routes are also available. Within the city, public transportation is available by bus. The HSR (Hamilton Street Railway) operates over 30 bus routes. For those needing to have their belongings moved to Hamilton, here are a few quick estimates. Numbers below are in pounds, based on an average household move.